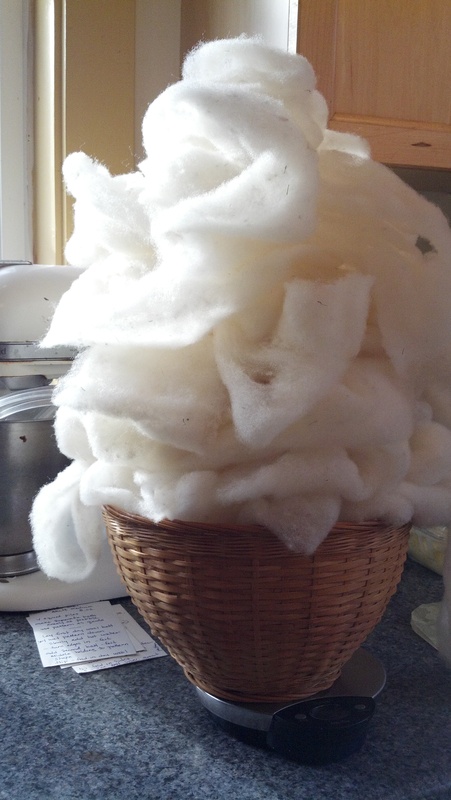 Fiber from our sheep, ready for felting. Sustainability is an integral part of our life and goals. We derive a lot of satisfaction from knowing that we can provide for ourselves. We appreciate the value of raising our children with an understanding of where our food and other life sustaining resources come from. Whether it be the wood we burn, the animals we raise, the vegetables we grow, or the soil we build, all contribute to our sense of connectedness to the earth. It’s important to us to know where our food comes from, how the goods we need are created, and the energy and considerations that go into it all. As we witness global changes, it becomes increasingly important to continue with a lifestyle that enables us to become less dependent on resources outside of our own farm and community. We continually strive for a more efficient and highly sustainable lifestyle. We’ve made a conscious decision to live this way and while it’s not always easy, it is always rewarding. We are happy to share what we’ve learned, and this site is another way we can do this. We welcome your insights and questions. Wow this blog is amazing. I so admire all you put into this life of yours.The world should be filled people like you !! Your site is beautiful and inspiring. We are working with the same values. Thank you for visiting our blog site. This life has its good measure of hard work but is always rewarding and keeps us mindful. Visit anytime, would love to meet you and chat about all things “wool” …..and more. Love your blogs and wonder if you do any speaking re: sustainable living? Glad you are finding interest in the blog and the nursery. Would love to talk with you about sustainable living, So important these days to consider our impact on the world. And yes, I am a true believer that small scale sustainablity can be achieved by most and makes a tremendous difference in the bigger picture. For so many with small holdings ( even less than an acre), sustainability practices can be applied. Would love to talk more, see you sometime this summer and thank you so much for reading! Just delighted to be introduced to your blog. My heart warms each and every time I discover a new Maine based blog. And we have so much in common, but you are miles ahead of us. I look forward to reading more and learning a thing or two from you. So happy to have discovered your blog as well…..a Maine girl living in Ireland! I come to Ireland to do some work every year, County Kerry, with a friend who owns a home there. It is awesome that a gal from Maine is living in Ireland and creating a sustainable life….love that! Finding your blog, a gift during this Maine winter of snow and cold ( which I actually love). I’m sure through this discovery and the common ground , there could be lots to share. I am a bit envious of your life in Ireland…love that country! Hope your winter has been mild and delightful…….are spring flowers just beginning to emerge? Denise, I do miss the snow. I always loved cross country skiing every chance I got. Having a young family, we have not ventured far off the island yet. The seven of us have only left the island all together three times now. One of those trips was a family wedding in Kerry. Just glorious, the countryside and the weather were all just glorious! How lovely for you to have a friend in Kerry to visit regularly. There are daffodils in bloom and some herbs and rocket have fresh growth. But it is still cold. The wind is like nothing I ever experienced on such a regular basis back in Maine. I am often praying that our poly tunnel is not lifted off into orbit. Seedlings will be started soon, I always start too early and then have an overflow of them in the tunnel and no weather to put them outside. I am holding out until mid March, everything except the lettuce. Fingers crossed, we’ve so much to learn.